Hometown heroes Boyz II Men were back in town Saturday performing at the Wells Fargo Center in South Philly as part of the Total Package Tour along with New Kids on the Block and Paula Abdul. Earlier in day, however, they were honored by the City of Philadelphia outside of their Alma Matter, the Philadelphia High School for the Creative and Performing Arts (aka CAPA). 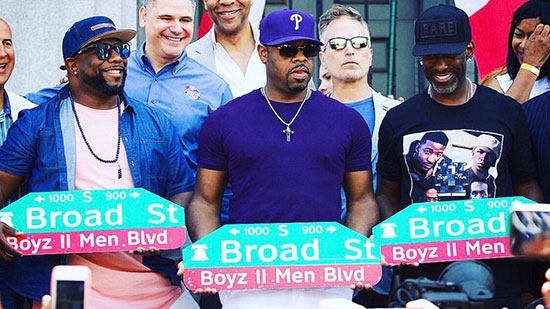 This past spring Councilman Kenyatta Johnson proposed a resolution that the portion of South Broad Street between Carpenter and Christian that is out front of the high school be renamed "Boyz II Men Blvd." The council approved the resolution on May 18th. The Grammy-winning, top selling R&B group consists of Philly natives Nathan Morris, Shawn Stockman, and Wanya Morris, who all attended CAPA. The group is known for their hits such as "MotownPhilly," "It’s So Hard to Say Goodbye to Yesterday," "I’ll Make Love to You," and "End of the Road." Boyz II Men will be honored at this year's July 4th Concert at the Art Museum and Benjamin Franklin Parkway. An American Airlines flight out of Philadelphia traveling to Frankfurt, Germany, on Saturday evening turned around and returned to Philadelphia International Airport due to mechanical concerns. AA Flight #750 departed around 6:30 p.m. and returned to Philly after 1 a.m. According to flight tracker, they made it out past Newfoundland, Canada, before turning around. A flight emergency was not declared but the crew was acting out of an abundance of caution. Travel arrangements will be made for the 421 passengers and 12 crew. Police are investigating after a woman was brutally attacked and killed early Saturday morning behind Dobbins High School in Strawberry Mansion. The 34-year-old woman was discovered by a passerby around 3:20 a.m. on the high school's property near 21st and Lehigh Avenue. She was stabbed at least a dozen times in her legs, torso, and chest. Her face had been beaten and she was covered in blood. Police say she was partially clothed but it is not clear if she was sexually assaulted. Investigators are looking into nearby surveillance footage for clues. Last night's storms hampered investigation efforts.